Wreckin’ stuff – almost as satisfying as scaring cats. I hate the current physics equations. I know most of it through-and-through, but I've got a few things to say to that Einstein fellow. Mass•1 equals the basis for this game. Mass•0^Velocity is closer to reality. Mass•Velocity = Energy^2 is very acurate in my book. The mass persuades velocity through a simple means of potential energy. The current physics right now are similar to this. However, I believe you need to incorperate GRAVITY. Gravity is the divider. Mass•Velocity/Gravity = Potential Energy^1. This means that the value of the Potential Energy is lower in Gravity then it is in space. I'm probably wrong though. Fire a remote detonaiting ball on top of the green pile of bricks softly so it then rolls of to the right hand side of it. Then detonate when the ball gets to the ground. It will blast all of the green blocks off to the left while being far enough away from the reds, so that it doesnt touch them. 205 points. You can get a bit more if you use one 5pointer but thats really hard. 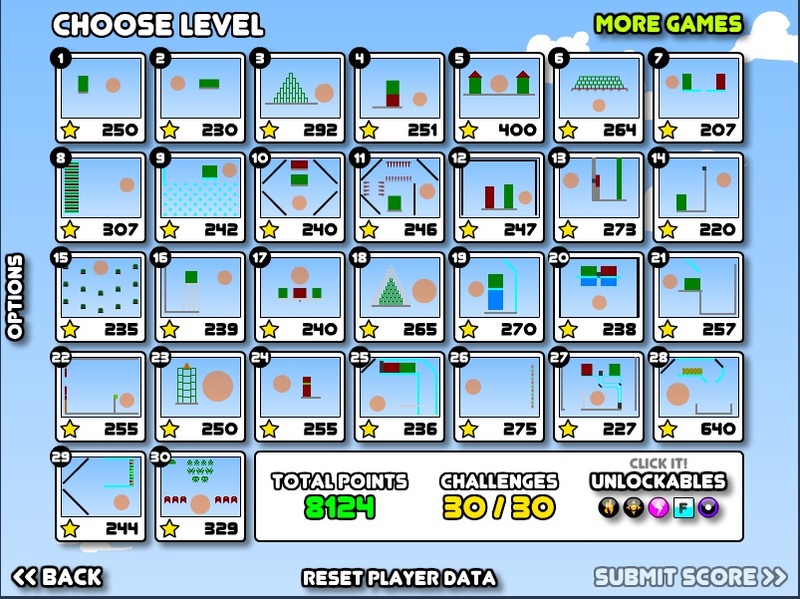 got stuck on level 7 :( can someone help me? Newton would have been proud. Well, Mine, hate to break it to you, but if this is an accurate physics game, you're wrong. Kinetic Energy equals mass times velocity SQUARED. Therefore, velocity is quite a bit more important than mass. However, since the maximum velocity appears to be the exact same for all types of balls in this game, the mass is probably the most critical factor, except perhaps when doing precision shots to try to remove a small number of blocks. haha i try to keep my gaming at the office to a minimum, but you really can't stare at the stuff i stare at for a solid 8 hours without going insane, so they tell us to take breaks every now and then. usually i check out the game first thing int eh morning and then the rest of the day is either spent working hard or eating cakes. delicious, delicious cakes. it's cost? the grammar is as bad as the physics. The creator knows nothing about physics. The size of a projectile is pracitically irrelivant compared to its speed. Newton will be spinning in his grave when he finds out about this games physics system. oh, i have an account. i even have a few medals. it just wont submit at work anymore because we're on ie 6 or something awful and its super out of date. kicking off another "week o' balls" ?